Cell phones are convenient, always available – 64% of cell-mostly internet users mention factors related to convenience or the always-available nature of mobile phones when asked for the main reason why they do most of their online browsing on their cell phone. Cell phones better fit people’s usage habits – 18% of cell-mostly internet users say that their online habits (or the habits of those around them) make their cell phone a simpler, more effective choice for going online. Just under one in ten (7%) say that they do mostly basic activities when they go online and do not require a more advanced device, while 6% say that they simply find their cell phone to be easier to use than a traditional computer. Cell phones fill access gaps – 10% of cell-mostly internet users point towards a lack of other access options as the main reason why they primarily use their phone to go online, with 6% saying that they do not have access to a computer and 4% saying that they do not have any other source of internet access beyond their mobile connection. These are the findings from a national telephone survey conducted March 15-April 3, 2012 among 2,254 adults age 18 and over, including 903 interviews conducted on the respondent’s cell phone. Interviews were conducted in English and Spanish. 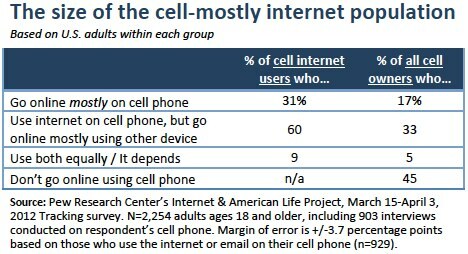 The margin of error for all cell phone owners (n=1,954) is plus or minus 2.6 percentage points, and the margin of error for cell phone owners who go online using their phones (n=929) is plus or minus 3.7 percentage points.